Confirmation is the final of the three Sacraments of Initiation -- Baptism, Eucharist, and Confirmation. The celebration of Confirmation includes the Laying On of Hands and the Anointing with Sacred Chrism (consecrated oil). Confirmation stirs up the Gifts of the Holy Spirit and strengthens us for action in our Church and our world. 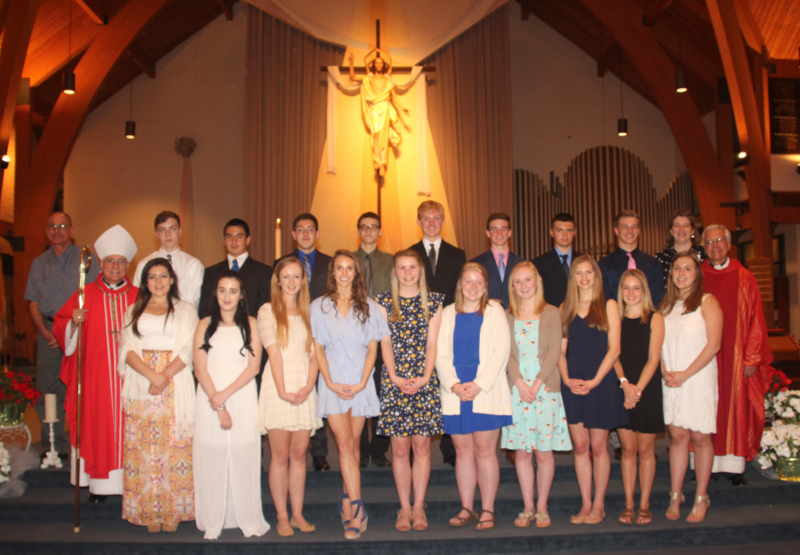 Confirmation is typically celebrated in the junior year of high school. The minimum age in the Archdiocese of Milwaukee is 16. Those interested in Confirmation should contact our Youth Minister, Liz Kuhn, at lizk@queenofapostles.net or (262) 691-1535 x108. Preparation includes class sessions. overnight retreat, events with sponsors, service experiences, and submission of documentation required by the Archdiocese of Milwaukee.